Our Kidney Belts are wide, leather belts that mainly provide protection to the Kidney area. These Kidney Belts are great for using when you are in the SCA sword fighting, but are also great for LARPing, creating or adding to a costume or outfit, and even for motorcyclists. We have many different styles of leather kidney belts, from Gladiator designs to traditional Medieval, as well as Fantasy and more Modern styled belts. 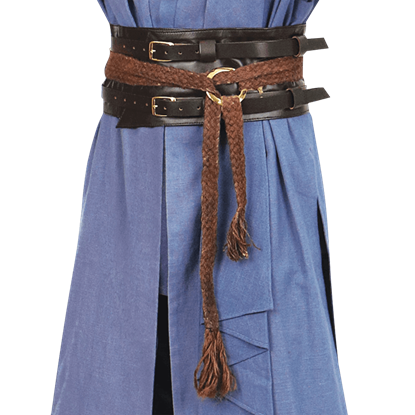 If you are LARPing or wearing a Kidney belt to a Renaissance Fair or as part of your outfit and you do not really need it for functional reasons, we suggest a medium weight leather, like 7/8 ounce. If you are doing full contact Re-enactments or plan on wearing this while riding a motorcycle, we suggest a heavier leather, such as the 13/15 ounce. Many of our Kidney Belts are made in our work shop, right here in the USA. A tree that is unbending is easily broken. Develop your roots with a stable center of gravity and relaxed muscles. Your child may be inspired by the trees around them when they wear this Childrens Woodland Warrior Armour Belt. This Dark Rogue Leather Belt echoes a medieval design that utilized the belt not only as an accent but also as a form of defense! The belt is made entirely from 5/6 oz. 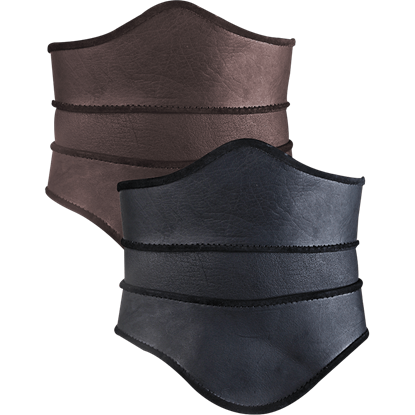 leather and serves well as a piece of armor around your abdomen. 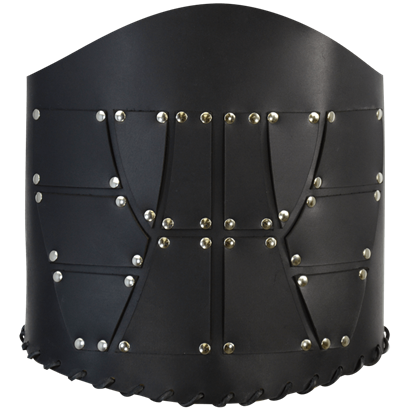 Transform yourself into a lady warrior with the help of leather accessories like this womens cincher! The Evandra Leather Belt fits snugly around the waist in a wide belt design that widens even further in the front. This wide kidney belt offers great protection in the coliseum. 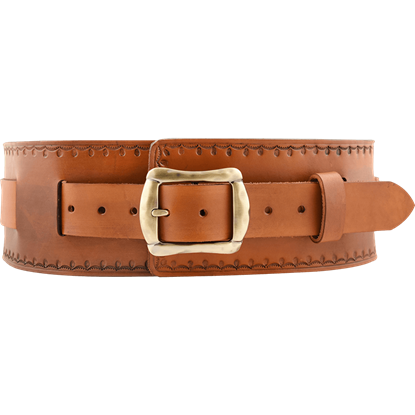 Made of an aged dyed leather, the belt has three adjustable straps with antiqued brass buckles for a secure fit. This is a classic style Gladiator belt. 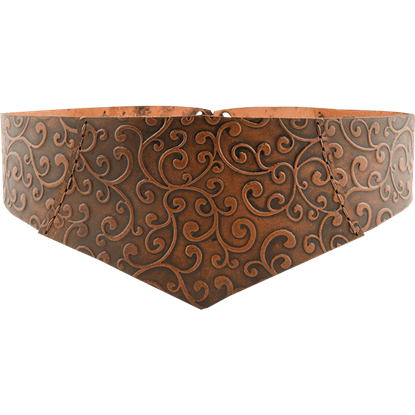 Adorn yourself with fantasy elegance when you wear the Ladies Elven Swirl Belt. 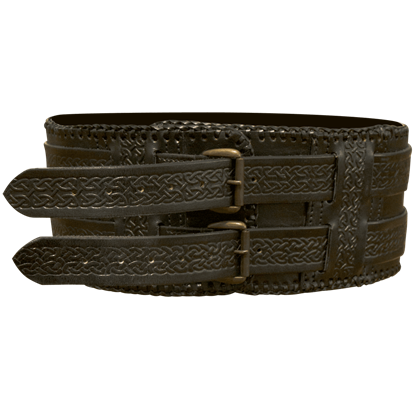 Made of high quality vegetable tanned leather and hand stitched together, this medieval fantasy belt is embossed with a beautiful swirling vine pattern. 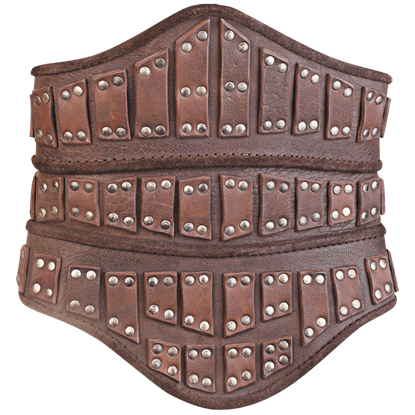 Be ready to wander the wilderness with your tribe by wearing the Leather Barbarian Belt! 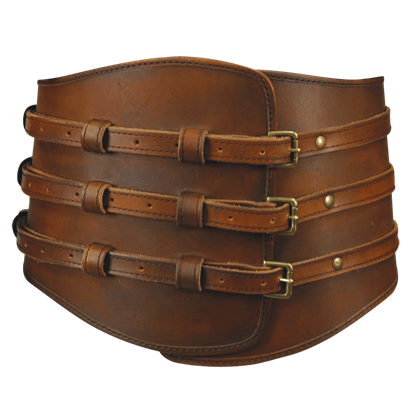 This double wide leather belt features two straps for twice the amount of space! think of how much stuff you could carry on it at one time! 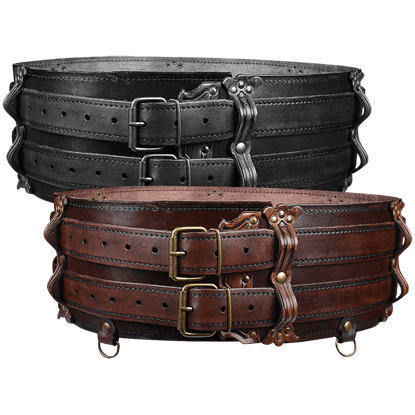 Take your accessorizing skills to the next level when you add the Luthor Leather Double Belt to your favorite reenactment outfit. 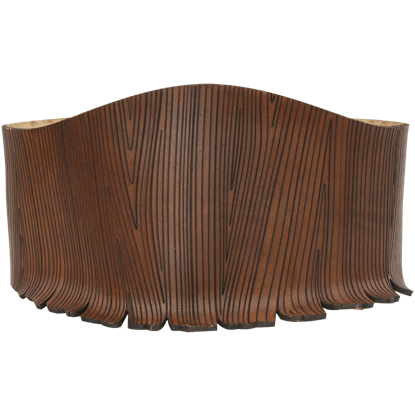 This wide leather belt features two additional leather belts threaded through its ornate belt loops. 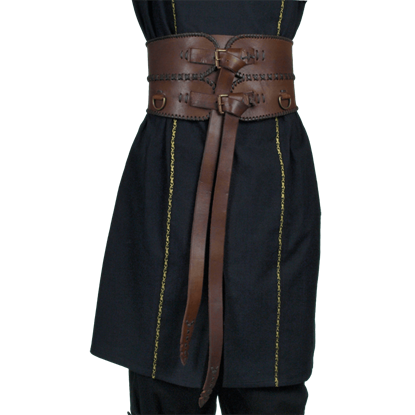 Make a statement when you add the Medieval Wide Belt to your Renaissance fair, LARP, or reenactment outfit. With hand tooled detail and a heavy duty buckle, this broad kidney belt will definitely impress no matter the occasion. Wizards travelling across rough terrain need a sturdy belt to hold their wands, bottles, and talismans in place. Luckily, the Mystic Leather and Hemp Belts are hardy enough to do just that while still serving an aesthetic purpose. This unique ladies medieval bodice is crafted from leather so thick it passes as a piece of womens armour. The Scarlet Armour Belt fits snugly around the waist in a wide belt design that widens even further in the front.